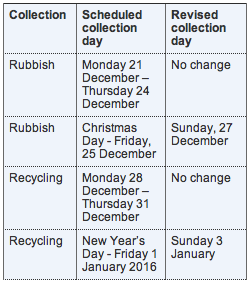 Monday 4 January – normal collections resume Don’t forget to leave your bin kerbside by 6am on your collection day and make sure your bin lid is fully closed. Additional recycling can be left by the side of your bin but please take any additional rubbish to the Community Recycling Centre in Charlton Lane, Shepperton. or call Customer Services on 01784 451499. Spelthorne Council is offering a free kerbside collection of real Christmas trees from 4 – 29 January 2016. We are not operating a booking system this year – simply leave your tree on your property boundary by 6am on your rubbish or recycling collection day. Trees should not be decorated or left in pots or stands. For further information: please email streetscene@spelthorne.gov.uk or call 01784 446411.